CVS 108 Artery Forcep Spencerwell's	Straight / Curved 5", 6", 7", 8"
CVS 109 Scissors Dressing Straight / Curved 5", 6", 8"
CVS 110 Dissecting Forcep Plain s.s. 6", 8"
CVS 111 Dissecting Forcep With Teeth s.s 6",8"
CVS 112 Dressing Forcep with catch 6"
CVS 113 Cheatle Forcep Stainless Steel 8", 10"
CVS 114 Spong holder Stainless Steel 9*1/2"
CVS 115 Babcock forcep stainless Steel 6", 8"
CVS 118 Mayo's Scissor Straight or Curved Size 14", 17",20"
CVS 119 Abcess knife Veterinary s.s.
CVS 120 Scalpel Veterinary Straight 17 cm long 2" blade s.s.
CVS 121 Needle Holder s.s Size 6", 8"
CVS 124 B.P knife Handle No. 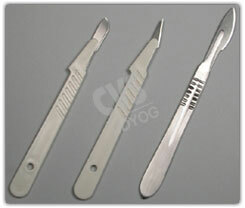 3 or 4 s.s.
CVS 126 Ointment Spatula Stainless Steel 8". 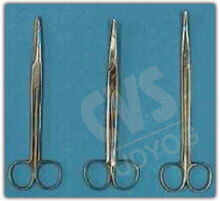 CVS 127 Towel Clip Cross Action s.s.
CVS 128 Horseley's Trephiness set of 3 with Detachable Handle in a case.